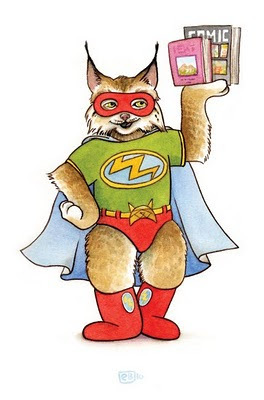 I'm still very excited about the new book and filling out my bag o' tricks for a fall/winter full of school visits and presentations. 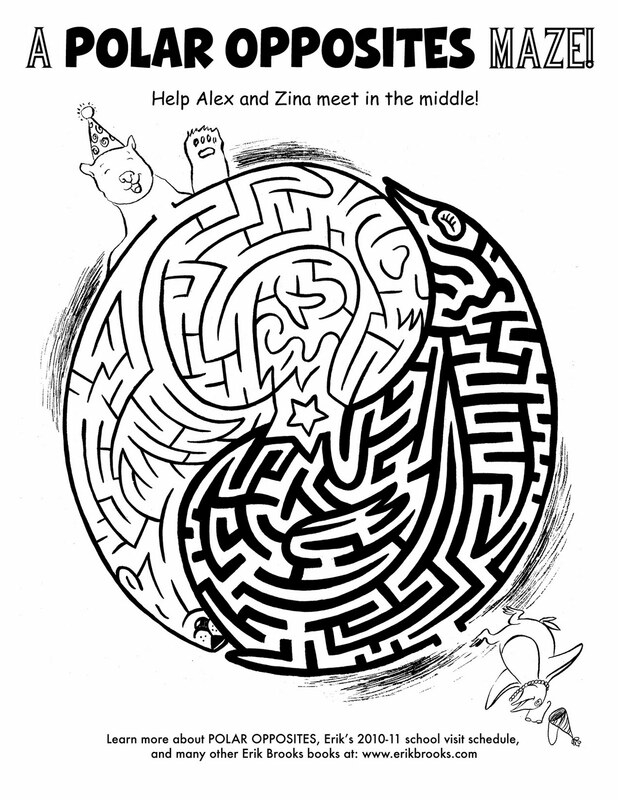 Click on the image to download and print a maze of your own. 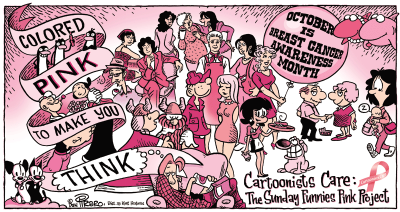 On October 10th, more than 50 of King Features’ cartoonists observed National Breast Cancer Awareness Month in the Sunday comics section of newspapers across the country. The Winthrop Art Walk, and a HUGE thank you! On Saturday night, October 9th, a small selection of artwork from Polar Opposites was on display for the semi-annual Winthrop Art Walk. 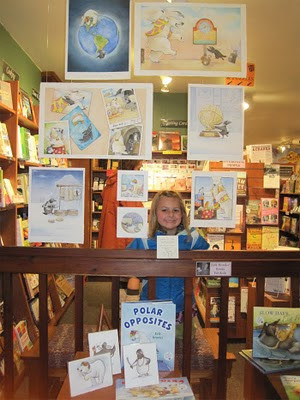 The art will hang for another week or two, but signed books can be purchased (and even personalized and shipped by request) at Trail's End Bookstore all year 'round! Also, a huge THANK YOU to the very generous donor who purchased my books & bowls collection at the Room One Soup Dinner on Saturday night. The bidding was reportedly "fast and furious" - with the 4 bowl set eventually earning $800 for this worthy non-profit. Really nice to hear! With my own recent comic experiments, I've had fun getting back into the groove of reading some daily strips. This was a ritual -- especially on Sundays -- for many years and is certainly one of those foundational interests that led me drawing my own characters, and becoming the artist and author that I am today. Like so many people, I especially LOVED the irreverence and imagination of Calvin & Hobbes, as well as a slightly more obscure outer space comic called Orbit (I think I have that name right?). 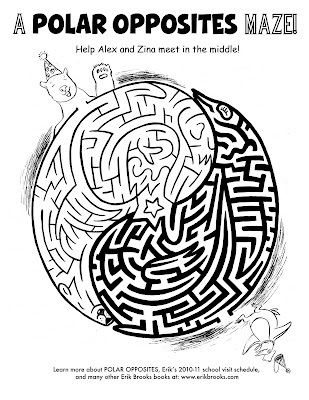 Anyway, last week I discovered this great little strip by Australian cartoonist Alex Hallat called Arctic Circle. It's funny and It's smart. Something that I hope to emulate in my own work both comic and otherwise. Minnesota illustrator friend Mike Wohnoutka gets some well deserved face time on a new Twin Citites Public Television feature called "Minnesota Original". Soup Bowls for the Soul! Room One is hosting its 4th Annual Soup Dinner on Saturday, October 9th. All summer, artists, citizens, and visitors of the Methow have been painting their hearts out in preparation. 200 bowls are glazed, fired, and ready to go! With the price of admission, you receive a bowl of your choice (they go fast of course), a wonderful meal, and a beautiful fall evening at the Winthrop Barn. There are also a number of artisan bowls that become part of a silent auction. As a extra treat, my inaugural participation includes a four-bowl set featuring characters from Polar Opposites, Slow Days, Fast Friends, and The Practically Perfect Pajamas. You will also receive signed copies of these books, AND a piece of original art for my new comic strip, Harts Pass. Non-valley residents can feel free to contact me with maximum bids (Erik's bowl set only). I'd be more than happy to facilitate a long-distance bidding frenzy!